To illustrate my problem, see Have attacks on humans by raptors other than owls been documented, excluding cases where they were defending their nests? You will see that I have three references to three articles, and the links are very, very long. It makes for an unattractive question. Others just put in a single word link. How do I do that? I have experimented, to no avail. Pick an important word or two to describe the link. Put those in brackets, like [this]. Without adding a space, put your entire source link in parentheses, like (article web address). Make very sure not to add a space. I've done that a lot and it not only doesn't link, but it does weird-looking things! What you end up with is an orange (or other color depending on the site) word to press on, which opens the page you referenced. Ab2 asked this interesting question. Have attacks on humans by raptors other than owls been documented, excluding cases where they were defending their nests? becomes: Ab2 asked this interesting question. Pressing on that orange word opens the source link, which is, in this case, your question. I've taken the liberty of doing it to that question. I don't have edit privileges here, but if someone approves it, I hope it will look like what you're seeking. You can then see exactly what I did by checking your edit history. If there's anything you don't like, please just rollback the edit to your original version. I don't want to do anything unhelpful. By the way, if you ever want a specific question edited, you can always leave a comment on it, and I'll gladly take care of it. I love editing! You can also try pinging me from chat, but I don't always get my messages! 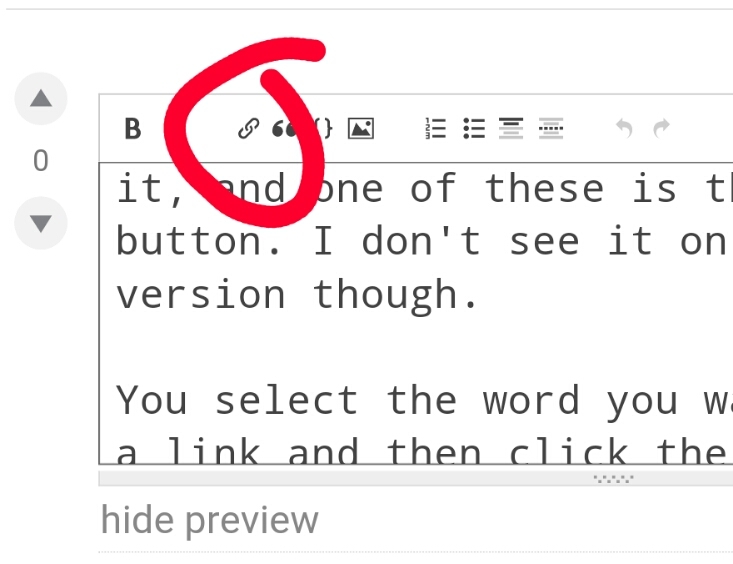 On the desktop version the text box you type your post in has some icons above it, and one of these is the link button. I don't see it on the mobile version though. You select the word you want made into a link and then click the link button. A box will open up allowing you to enter a URL. In this case, "some words" will be clickable with the actual URL hidden.